The gastric sleeve, also known as a sleeve gastrectomy, is a bariatric surgery in which your stomach is reduced to 15% to 25% of its original size in order to restrict the amount of food intake and aid weight loss. Short-term: leave hospital 2 to 3 days after surgery. Avoid strenuous activity for the first 30 days. The cost of a gastric sleeve depends on where you choose to have surgery and your individual needs. The pricing differential depends on many factors, such as cost of living, exchange rates, practicing costs or regulatory conditions, which may differ greatly from country to country. The gastric sleeve, also known as a sleeve gastrectomy, or plainly, the sleeve, is a bariatric surgery that works by restricting the amount of food intake and regulating hormone production in the gut. During a gastric sleeve surgery, a patient’s stomach is reduced to 15%-25% of its original size. What is Body Mass Index (BMI) and how do you calculate yours? Body Mass Index (BMI) is a globally accepted measure of body fat based on the relationship between height and weight. 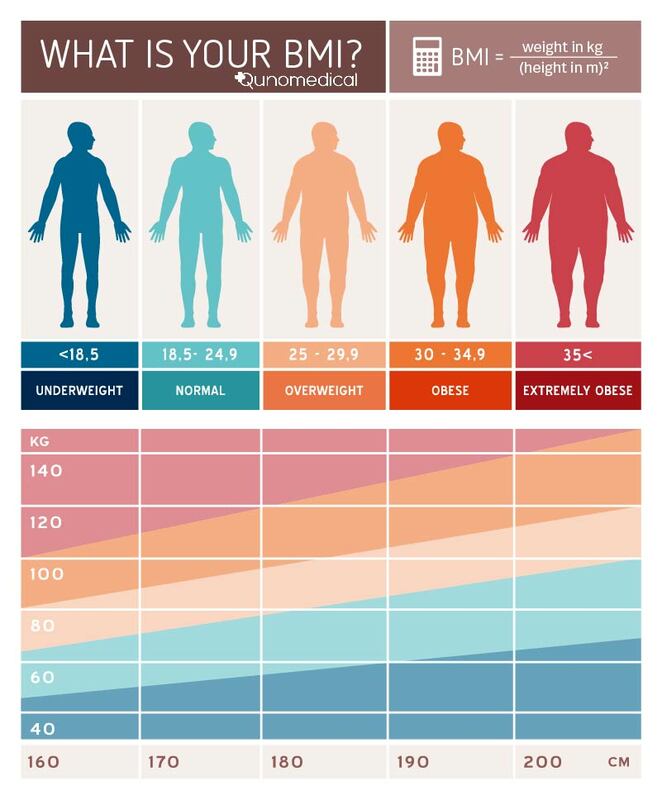 While BMI is an effective screening tool to determine whether an individual is in a weight category that may lead to health problems, BMI alone is not a diagnostic of body fatness or the health of an individual. BMI is universally expressed in kg/m^2. What does a gastric sleeve procedure involve? 1. The patient is administered general anesthesia. General anesthesia will render the patient unconscious during the whole procedure, which typically lasts 1 to 2 hours. 2. Once the patient is asleep, the surgeon will create 5 small incisions in the abdominal wall that will be used to place a camera and specific surgical instruments to carry out the surgery. The camera will display the images on a monitor in the operating room. 3. The patient’s abdomen will be then filled with carbon dioxide gas to create more space between the organs and ensure a safer operation. 4. The surgeon will insert a bougie tube into the stomach that will serve as the sizer of the new stomach. 5. The stomach will be divided into two parts: starting from 4-6 cm (1.5-2.5 inches) from the pylorus, the valve between the stomach and the small intestine, the surgeon will remove around 80% of the stomach and leave a banana-shaped pouch. 6. The bougie tube will be removed. The new stomach now represents 15-20% of its original size and will be closed using surgical staples. 7. All the instruments will be removed and the incisions will be closed with stitches. How do you prepare for a gastric sleeve surgery? A gastric sleeve surgery requires some preparation before the actual procedure, and your commitment to follow all pre-op and post-op guidelines. This includes a pre-op diet that your doctor or surgeon will ask you to follow. A pre-op diet will help you lose weight and reduce the dimensions of your liver, which, if overweight, can pose some risks during surgery. A pre-op diet usually includes increasing protein consumption (lean meats), reducing carbohydrate intake (pasta, bread, and rice), and eliminate sugars (candy, desserts, juices or sodas). What should you expect from a gastric sleeve procedure? With the gastric sleeve procedure, food is digested and absorbed as it normally would be, just in much smaller quantities. The main advantages of this particular type of bariatric surgery is that it induces rapid and significant weight loss and involves a relatively short hospital stay (usually around 2 days). The gastric sleeve is a non-reversible procedure and does have potential for vitamin deficiencies if a proper diet is not maintained in the long term. What are the lifestyle changes that go along a gastric sleeve procedure? Many factors contribute to successful weight loss with gastric sleeve, including the patient’s ability to make lifestyle changes and maintain them in the long term. Patients will receive a nutrition and lifestyle plan from their doctors with diet and post-operative guidelines that they are strongly encouraged to follow. The right bariatric diet after surgery typically includes a high-protein, low-carb diet, with a slow transition from pureed to solid foods. Vitamins and protein supplements will also be included in the diet to allow the body to function at its full potential, help avoid malnutrition and vitamin deficiency. Patients are also recommended to drink extra water (2 liters per day) and avoid high-calorie beverages. Patients may expect a moderate or sometimes dramatic change in their eating habits: snacking should be minimal, portion sizes small and food needs to be chewed thoroughly and slowly. The new way of eating may seem overwhelming at first but most patients adjust to the new guidelines over time and make them part of their daily routine. Exercise can help you lose more weight, give you energy, and feel better. Exercise after bariatric surgery is aimed at reinforcing endurance, flexibility and strength. Right after surgery, it is important to start slow and take slow walks for the first 6 weeks after surgery. You will gradually progress over the following weeks towards your own fitness goals, going from light exercise, to cardio, and strength training. Daily exercise should become an integrating part of your life as it will not only support your weight loss but also improve your health overall. Massive weight loss can result in loosening or sagging skin, and that is why many patients opt for post-bariatric body contouring surgery to improve their overall appearance. Surgery can typically be performed 12 to 18 months after surgery when a patient has lost significant weight and has adapted to lifestyle changes. Procedures include body lift, arm lift, thigh lift, and neck lift. In terms of emotional challenges, some people may experience changes in their interpersonal relationships or hurdles with self-acceptance, due to the process of adjusting to their new body and new life. In order to maintain both physical and mental health, support groups and networks, counseling, and friends and family can help patients feel better and stay focused. Follow all pre-op guidelines given by your doctor. These may include a high-protein, low-carb pre-op diet, or a liquid-only diet. Keep yourself hydrated (two liters of water per day). Do not smoke for at least 30 days before surgery. Make sure you are under good and constant medical supervision. You will be administered general anesthesia, so you will be asleep during the whole procedure. Follow all post-op guidelines provided by your doctor. These may include a liquid-only diet for a full week. Make sure that you have psychological support throughout your recovery and beyond. Commit to a consistent workout routine: take slow walks 6 weeks after surgery and increase your training week after week. Avoid heavy lifting for the first 30 days after surgery. Avoid alcohol for 6 months after surgery.